Hi Jurgen the date of first registration on the V5 shows 12th November 1998, sorry not getting the SMS messages I'm afraid. I've had one of these just over 5 years, bought it new and done 100,000 miles in it so far, great fun! Rear wheel bearings tend to go quite quickly as the rear brakes can bind a bit and generate a lot of heat, and I needed a radiator at about 80,000 but otherwise has been really good! Hi all Over the weekend I made a heat shield for the alternator on my 2.0 Pinto SEW. Pretty pleased with how it turned out, its a piece of tin covered in Turbo blanket material and edged with Aluminium tape. Reason i did it is that the alternator is nestled just beneath the manifold, and the plastic end cap has started to melt a bit. I'd like to find a replacement end cap for it, so wondered can anyone help with the alternator model number / code? Thanks in advance for any help! Dave recommended a Hamilton cover when I asked, and it has been great so far, though a bit above your budget even with the WSCC discount. That looks even neater than the one I used! I've started playing around with tyre pressures on my car in an attempt to improve its ride a little. It has 195/50/15 tyres and as a pinto car is a little heavier than some - about 630kg according to the records from a weighing session a few years ago before the rear wheel was removed. Appreciate the stiffness of suspension has a bearing but does anyone have any recommendations? 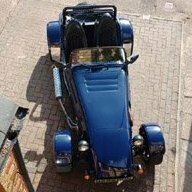 So my westfield has been with me a couple of months now, so the last couple of weeks have been enjoying running round in it, making the most of the decent weather. Still had time to do a few small jobs, including rehanging the exhaust with new rubber bobbin and clamps, and fitting a new horn button as the old toggle switch just to the right of the steering wheel was all to easy to knock when turning the wheel! Also added a "powered by Ford" badge at the rear, which was looking a bit stark without the spare wheel on it. Small things but each little bit does seem to improve the car! 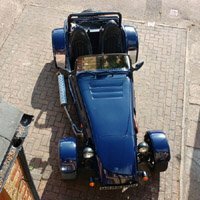 Excellent thread and what an interesting little car! Many thanks everyone, really helpful!